Okay, so it’s not officially the first day of fall, but September marks that beautiful transitional season from summer to fall when the mornings are crisp but the afternoons are still warm. 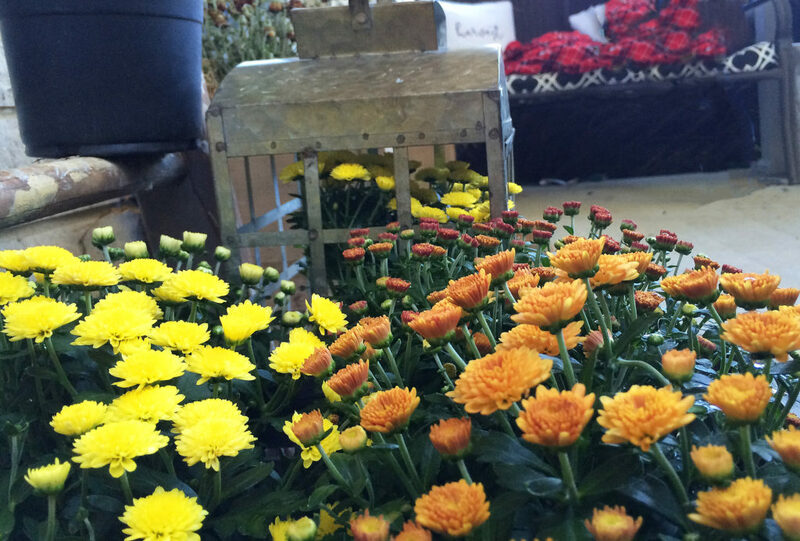 Labor Day signifies the last summer holiday of the year, and have you noticed all of the garden centers have mums out? 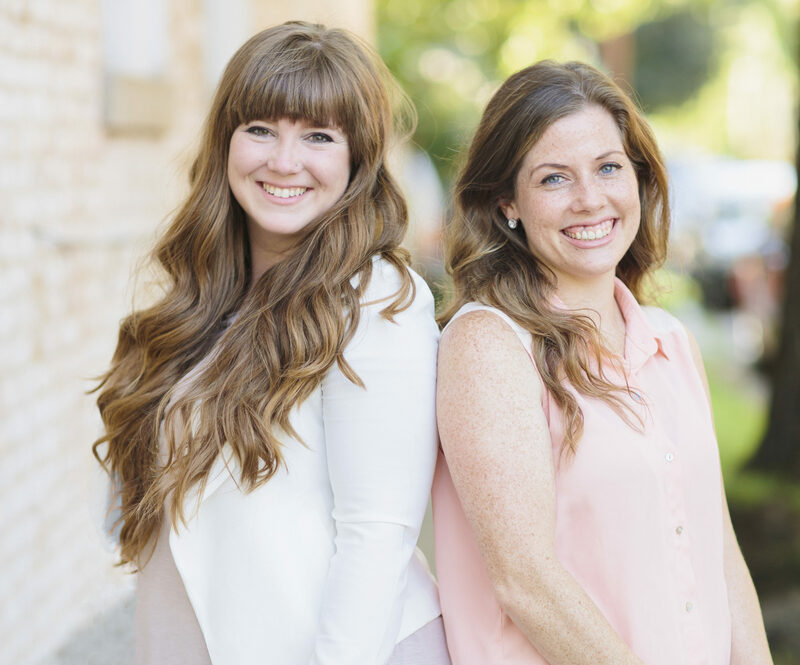 Fall Home Tours are all over our Instagram and blog feeds and while we’re not posting a full tour, we wanted to show you some of the ways we’re already celebrating this year! 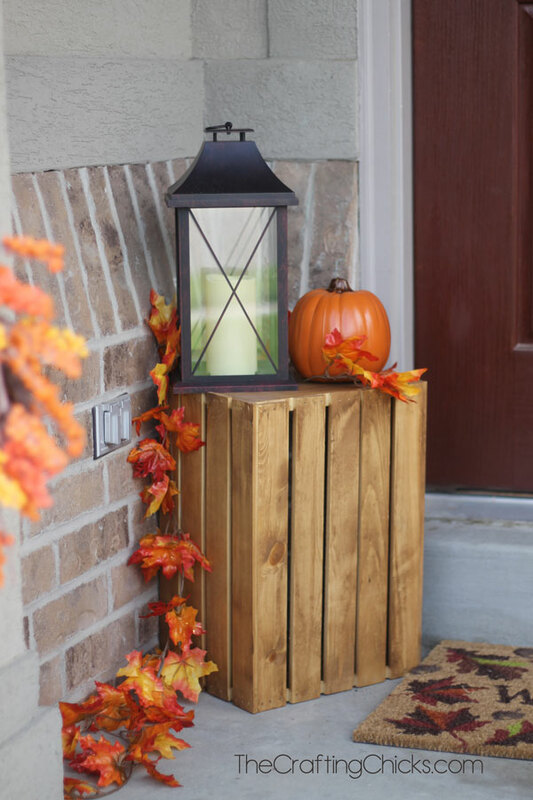 We’ve got some really fun fall decor, DIYs and recipes ready to share as autumn gets into full swing, but until then, here’s how we’re welcoming in the season and some ideas to get you inspired! 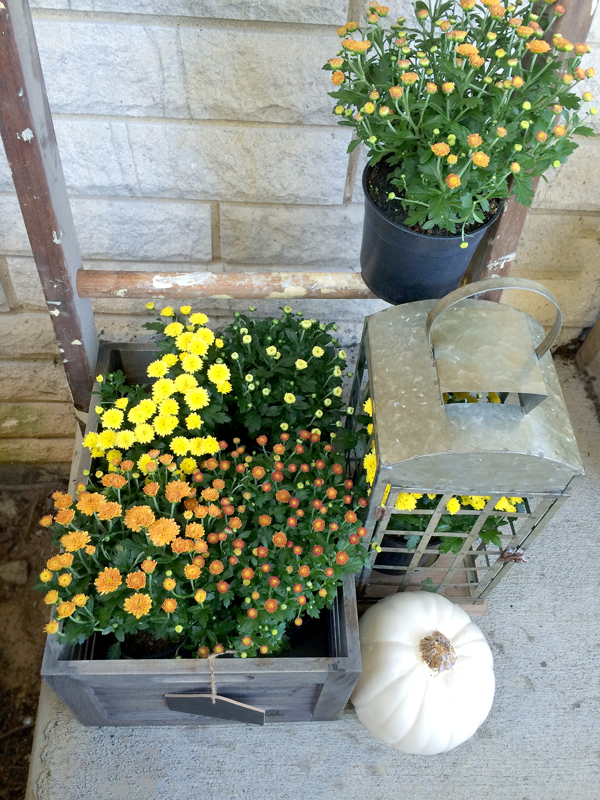 Nothing screams fall is here like mums and pumpkins! The white pumpkins are from Michaels, the lantern and bin from Gabriel Brothers and the mums from Lowes. The harvest-themed pillow covers are made from duck cloth and a fabric marker (we’ll be posting a tutorial later this season). 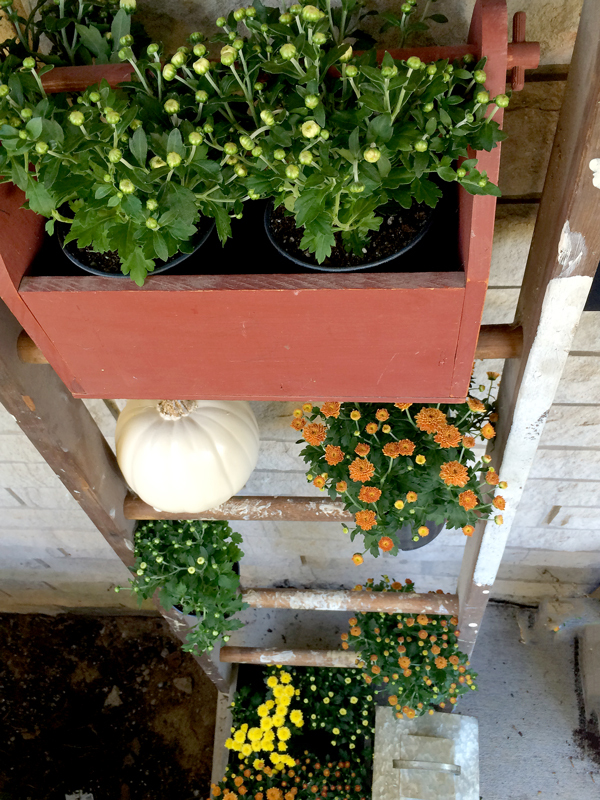 Jess used half of an antique ladder to create shelving for the mums and pumpkins. To see how she used the other half, click here. The vintage toolbox is from one of our junkin’ trips! 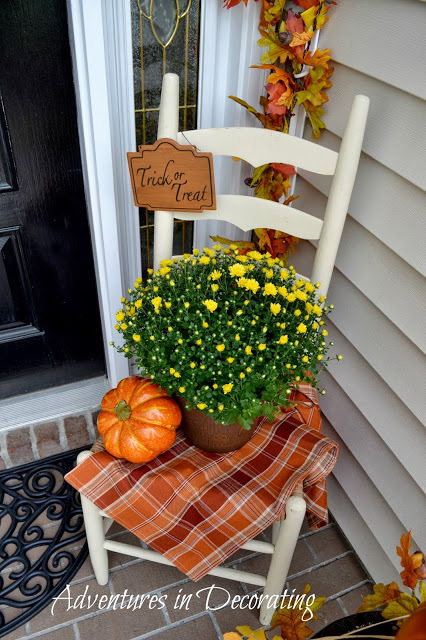 We love the idea of using an old wooden chair as the foundation piece for your little fall vignette. Don’t have a spare chair? 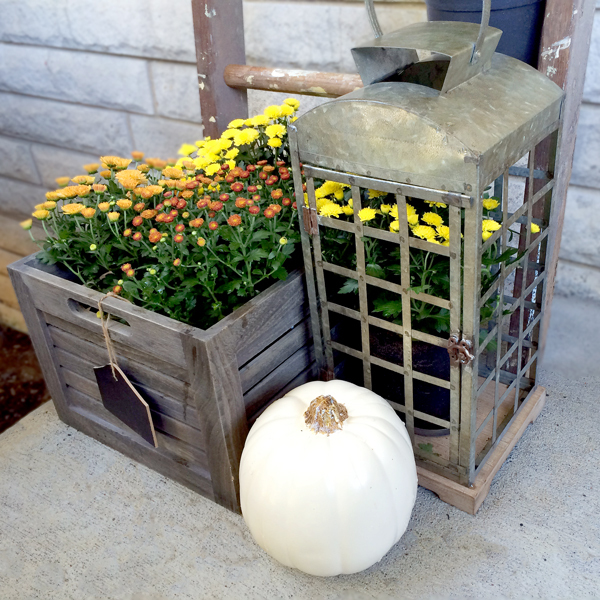 A wooden crate works just as well and is perfect for small spaces. 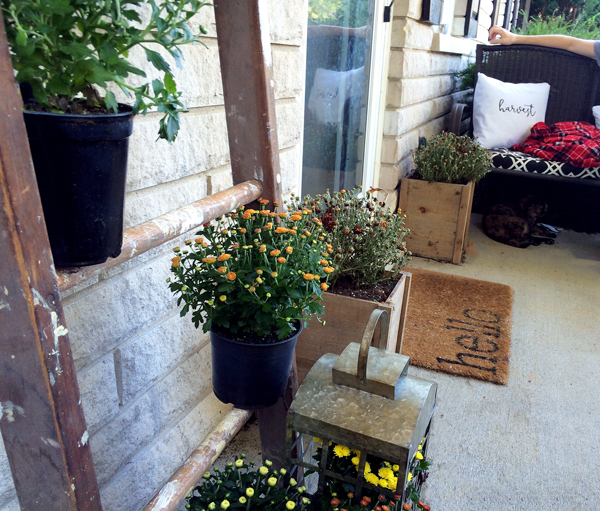 Amanda is using the following example for inspiration outside her front door. 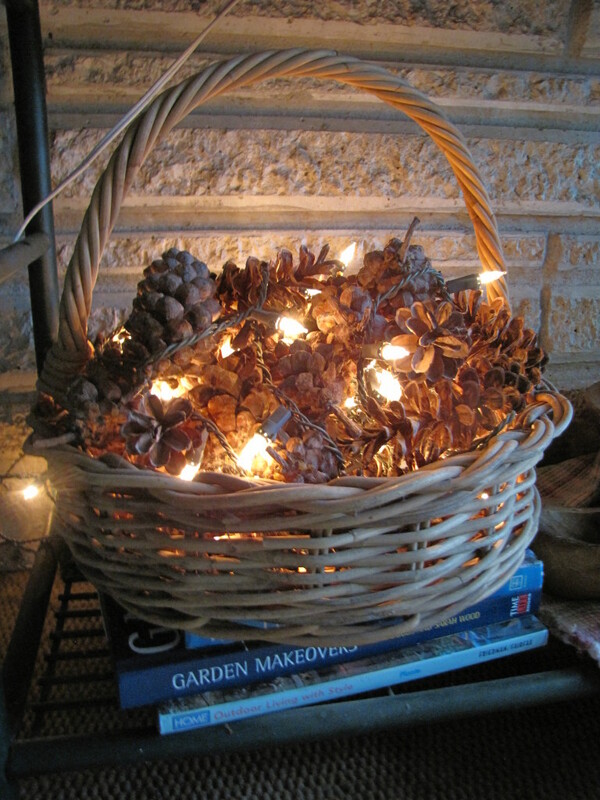 Are we the only ones that find pine cones cozy? 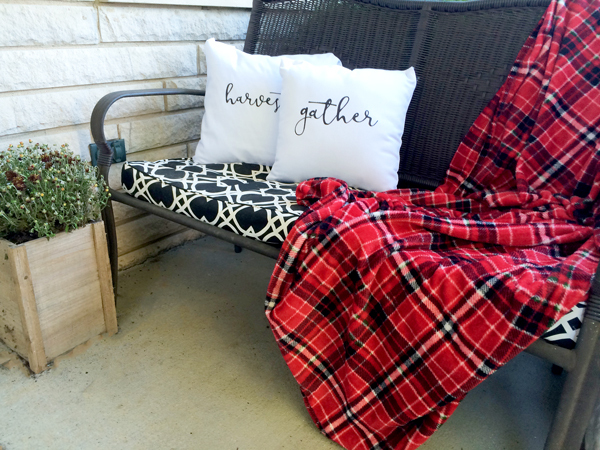 We may not be able to snuggle up to them, but there’s something about bringing these outdoor decorations inside that makes any space feel warmer. Adding some twinkle lights gives it that finishing touch. 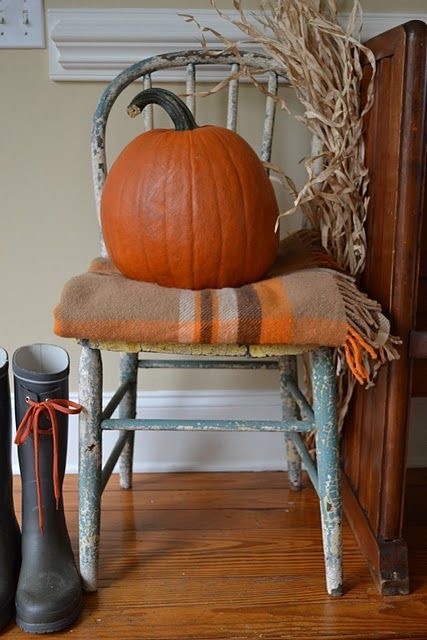 This is a perfect centerpiece or end table decoration: simple yet beautiful. We always love a good chalkboard addition to any space. 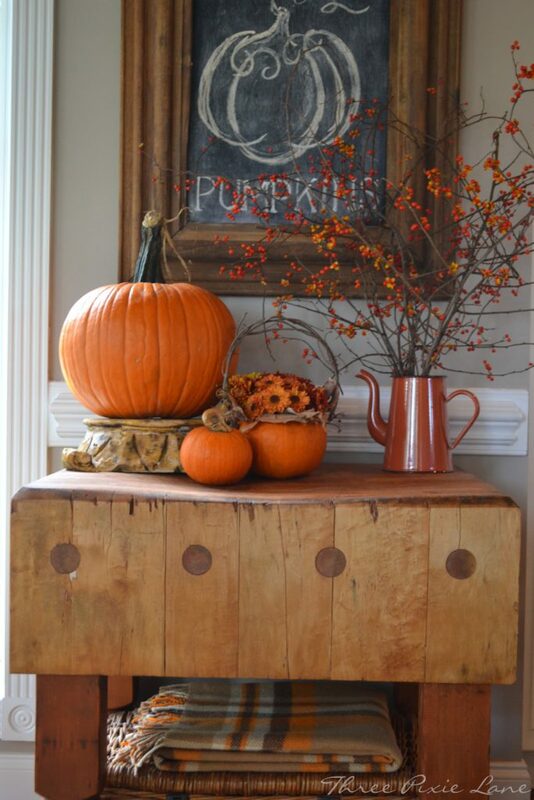 Throw that into the mix and your space instantly has even more rustic, autumnal charm. 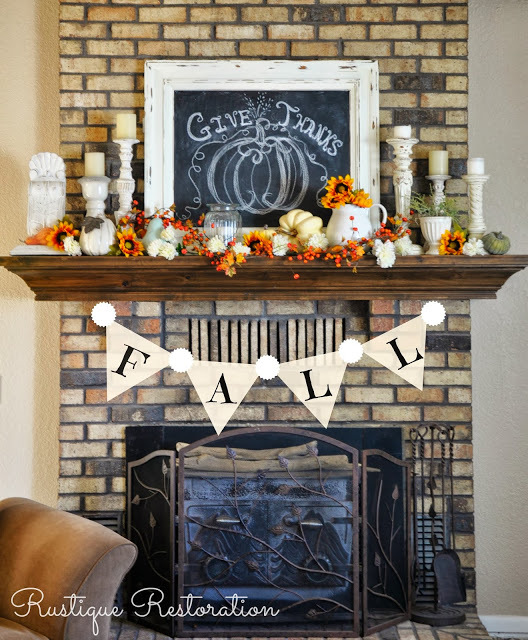 Who doesn’t love a good fireplace mantel? And don’t we always need fresh inspiration for decorating one? 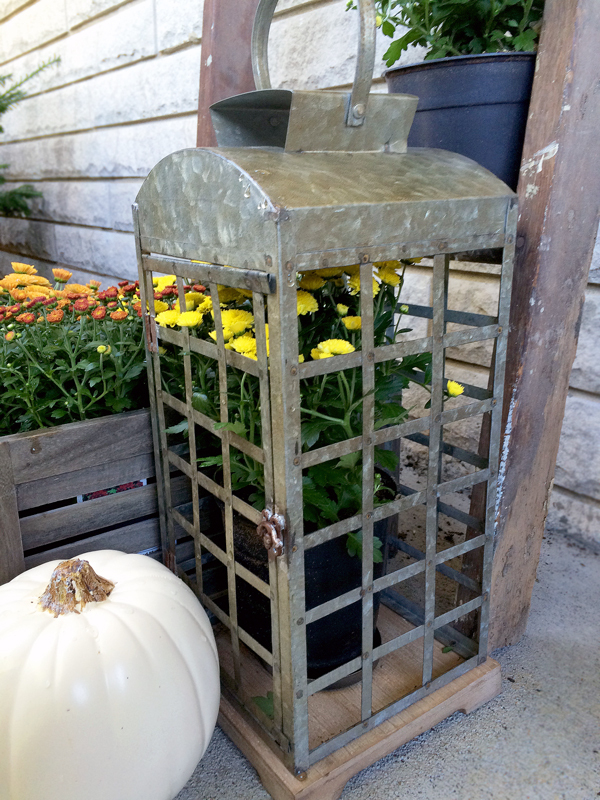 We love this one by Rustique Restoration. Adorable chalkboard art! 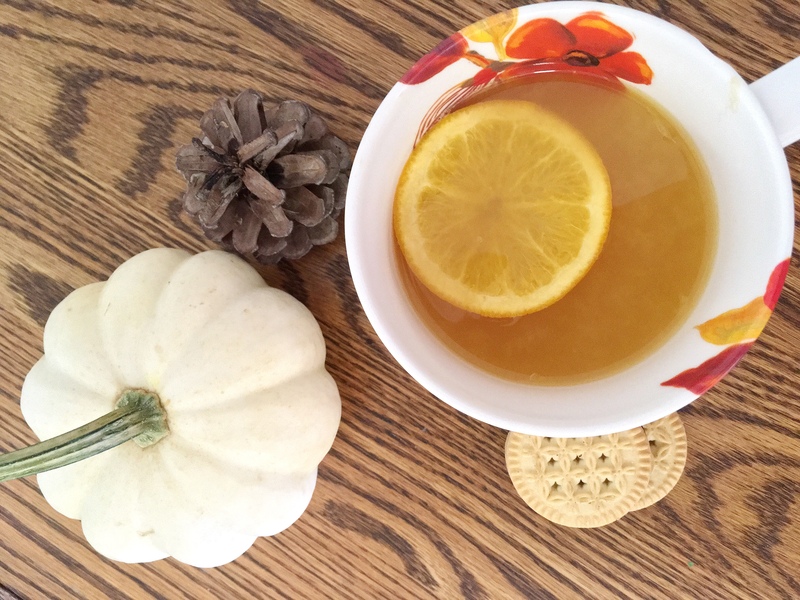 It’s really just a few simple items placed together in a complementary way. Thankfully, even if you don’t feel you have an eye for these things yourself, there are plenty of examples from people that do. It gives you a place to start, and from there, you can make it your own! We hope you had a fun and festive Labor Day, friends!